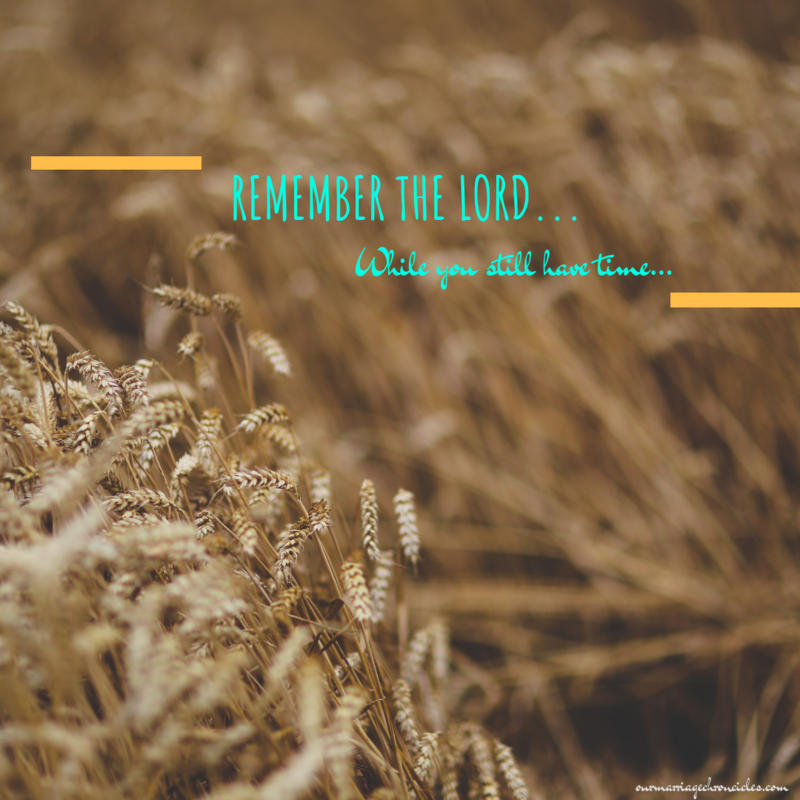 REMEMBER THE LORD WHILE YOU STILL HAVE TIME. The Lord of today, the Lord of tomorrow, commands both the living and the dead, so remember Him when you still catch a breath. Nothing brings His heart to a standstill, noting fall outside His plans, nothing is hidden form His face, there is nothing He has not foreseen. Everything He does will endure forever, nothing can be added to it and nothing taken from it. We can only trust that He holds our today, and holds our tomorrow, therefore, remember Him while you still catch a breath. Life is so fleeting, we make plans but He establishes them, we put our goals down, but he directs them. Like a flower scorched by the sun, one breathe of win form Him causes us to cease. Enjoy every gift bestowed on you from Him, for the ability to enjoy them too comes from Him. Do not be too preoccupied with the gladness of heart, that you forget He is the Lord of today, and the Lord of tomorrow, remember Him while your heart still beats. The race is not to the swift, or the battle to the strong, nor does food come to the wise, or wealth to the brilliant, or favor to the learned; but time and chance happen to them all, so remember Him while you still have this breath. No one knows when their hour will come, remember him before the silver cord is severed, and the golden bowl is broken, before the pitcher is shattered at the spring, and the wheel broken at the well, and the dust returns to the ground it came from, and the spirit returns to God who gave it. Remember the Lord while you still have time, and you can catch one more breathe. Previous PostTHE SEASON OF SINGLENESS. Next Post30 DAYS OF GRATITUDE: DAY 28: BE HIS FAITHFUL STUDENT.